This recipe combines the flavors of the sea with those of the garden. The tomatoes enhance the flavor of the fish and also make a nice side dish. I used fresh herbs in this recipe, but if you have dried herbs, feel free to use them. If you are using dried herbs, use just a pinch because they have a stronger flavor. If you cannot find sea bream fillets, this recipe also works well with sea bass fillets. Wash the fillets and dry them thoroughly. Lightly flour. In a pan, pour the olive oil and add the finely chopped onion. Cook the onions slowly until they become transparent. Add the cherry tomatoes that have been cut in half. Cook over high heat for about 7 minutes, adding a bit of salt. 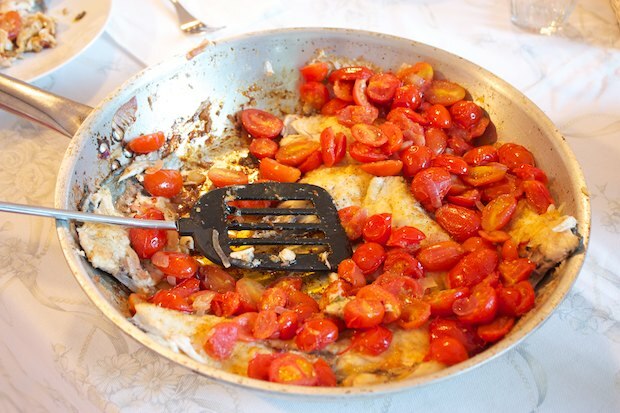 Remove the tomatoes with a slotted spoon from the pan and put them aside. In the same liquid, sauté the fillets, skin-side up. Cook 5 minutes over high heat, add a bit of Martini and let it evaporate, then turn the fillets and cook another 5 minutes. Season with salt and pepper, add the finely diced herbs and tomatoes back to the pan and continue cooking for another 5 minutes. Serve in individual plates with a bit of tomatoes on top each fillet. 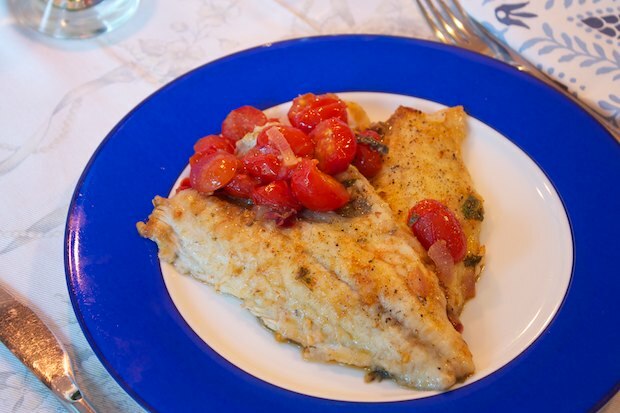 Posted in Fish, Recipes and tagged with Orata ai Pomodorini, Sautéed Sea Bream Fillets with Tomatoes. RSS 2.0 feed.